McKechnie Field is a baseball field located in Bradenton, Florida. It is the spring training home of the Pittsburgh Pirates and is named for Bradenton resident and baseball great, Bill McKechnie, who led the Pirates in 1925 and the Cincinnati Reds in 1940 to World Series titles. He was also a coach of the Cleveland Indians in 1948. Several notable members of the Baseball Hall of Fame such as, Roberto Clemente, Willie Stargell, Bill Mazeroski, Babe Ruth, Ted Williams and Mike Schmidt have played at McKechnie Field during their careers. The stadium also hosts minor league baseball games for the Bradenton Marauders, the Pirates' High-A club in the Florida State League. McKechnie's nostalgic charms in its city neighborhood appeal to many baseball traditionalists and ballpark enthusiasts, and some consider the facility to be Florida's version of Fenway Park. It's built in a Florida Spanish Mission style, with white stucco on the main grandstand and cover bleachers over the reserved seating section. The Pirates and the City of Bradenton celebrated their 40th anniversary together during the 2008 spring training season, which included an agreement between the city and the Pirates to continue their partnership through 2037. The field is currently the oldest stadium used for spring training as well as the second-oldest in the Florida State League (behind Jackie Robinson Ballpark, built in 1914). It is also the third oldest stadium currently used by a major league team after Fenway Park, built in 1912, and Wrigley Field in 1914. The stadium also formerly hosted an annual charity game between the Pirates and the State College of Florida, Manatee–Sarasota. Several improvements to the field were also made possible through the efforts of the Bradenton Boosters, a volunteer club of local residents that not only raises funds for ballpark improvements, but also operate McKechnie Field on game day. Since 1979, members of the Boosters have volunteered as the Pirates spring training game-day staff. The booster club's 120 members currently serve as ushers, program sellers, security personnel, merchandise sellers, and press box attendants throughout spring training season. Prior to its construction, the stadium's location was the site of Ninth Street Park, which was used by the Bradenton Growers of the Florida State League. The site was also the home to the Manatee County fairgrounds as well as a local nine-hole golf course. On December 9, 1920, the Manatee County Board of Trade voted to bring major league baseball to the county in an attempt to stimulate the local economy. Prior to the 1920s, no major league team played south of St. Petersburg. However Robert M. Beall Sr., the founder of the Bradenton-based department store, Bealls, as well as the team president and majority owner of the Bradenton Growers, was connected to Sam Breadon, the owner of the St. Louis Cardinals. Breadon also owned a citrus grove inside the county and was familiar with the area. Beall then convinced Breadon to move the Cardinals from their training facility in Orange, Texas to Bradenton. As part of the agreement, Beall agreed to sell $2,000 in tickets for the exhibition games. In a joint venture between the Cardinals and the city, the ball field was constructed with a grandstand and bleachers for $2,000. The baseball field was just east of where McKechnie Field stands today, on the site of the Bradenton Golf Club, a nine-hole golf course. So after completion, city engineers discovered that the field's second base, was 14 inches lower than home plate, and the outfield was even two feet lower than second base. However the park opened in 1923. The Commissioner of Baseball, Kenesaw Mountain Landis attended field's opening ceremonies. He was flown in on a biplane, which was piloted by Harry Land, a member of Manatee County Board of Trade who approved bringing major league baseball to Bradenton. The plane landed in what was the outfield at the time, a par 5 hole. In 1923, the grandstand sat 1,300 and 700 could easily occupy the bleachers, which included separate facilities for segregated African-American fans. Meanwhile, the fairground buildings were converted into makeshift locker rooms. The Bradenton Growers moved in and occupied McKechnie Field, which was then named City Park, from 1923–24, and again in 1926. The field was later renamed Ninth Street Park and then Braves Field. The Cardinals played in Bradenton in the very next season, before leaving for Stockton, California in 1925. However they were replaced by the Philadelphia Phillies who played in the park until 1928, until they left for Winter Haven. In 1928, the Boston Red Sox were looking at possibly coming to Bradenton, after spending the prior three years training in New Orleans. However, before the team would commit to the Bradenton, the Red Sox officials asked to see the attendance and financial figures of what they would see if they moved their training to Bradenton. Robert M. Beall Sr. then supplied the Red Sox with the actual figures they requested. The Boston officials were impressed with Beall's honesty. Every other city, competing for the Red Sox, had given the club figures on what they might have they choose their city, not their current factual figures. The Red Sox trained in Bradenton until 1930. That season the Cardinals returned to Bradenton and would stay their for the next seven springs. In the 1930s, the Cardinals returned during what journalists refer to as "the gashouse gang era". During that time they had a lot of great ball players including Paul Derringer and future-Hall of Famer Dizzy Dean. Dean, who played at the stadium in the 1930s, liked Bradenton so much, he bought a local gas station and hung out there when he wasn't playing, giving the Cardinals' famed Gashouse Gang its nickname. Dean also bought a home in Bradenton. To keep him out of trouble, the Cardinals sent him down here weeks before spring training, and paid a local sportswriter to keep an eye on him. In 1937 the Cardinals moved their training to City Island Ball Park, located in Daytona Beach. The Boston Bees (today's Atlanta Braves) played at the stadium until 1941, when they left for San Antonio, Texas. The stadium would not host another team for seven years. During World War II, many major league teams avoided the long trip to Florida for training, opting instead to hold their sessions closer to their home cities to cut down on costs. However the United States military used the field as a training base from 1941 to 1945. The base was first named Camp Bradenton. However the name was later changed in 1943 to Camp Weatherford, in honor of Pfc. Willie Weatherford, who was the first Florida native killed in the war. The baseball field was filled with temporary buildings and tents and used as a United States Army Signal Corps training facility. The offices of the city's Public Works Department are next to the ballpark on land that was also part of the camp. The camp was attached to Drew Army Airfield, located in Tampa. When the war ended, that airfield became the Tampa International Airport. Meanwhile, the Camp Weatherford location was used once again for baseball. A historical marker now stands between the city offices and the stadium. In 1948, Lou Perini, the owner of the Boston Braves (later renamed the Atlanta Braves) moved his club's spring training to Bradenton, after finding his club's training facility in Fort Lauderdale too windy. The Braves played in Bradenton for one year, however the city stated that if the Braves agreed to return the very next season, the city would build new clubhouses, field boxes along the first and third baselines and a new press box. The Braves agreed and stayed in Bradenton until 1963. The Braves won three National League pennants while they trained there in 1948, 1957 and 1958, and won the 1957 World Series. In 1953 the Braves moved from Boston to Milwaukee, but kept playing spring ball in Bradenton. Future Hall of famer, Hank Aaron played his first games in the major leagues in Bradenton as a rookie in 1954. In 1950, Bradenton became the first club to bring allow an African-American baseball player, Sam Jethroe of the Boston Braves. This was a major breakthrough because had Florida not allowed him to join, the state would have lost all of its baseball clubs. In 1962, the stadium was finally renamed after Bradenton-native, Bill McKechnie, in honor of his induction that year into the Baseball Hall of Fame as a manager. However, after the 1962 spring training session, Lou Perini moved the Braves to Connie Mack Field, after spending $1 million on a development in West Palm Beach. The city scrambled to get a new major league team in McKechnie Field. The city and the Philadelphia Phillies almost landed in Bradenton, however city official in Clearwater fixed several of the issues that the Phillies were unhappy about at Jack Russell Stadium. That same year the field was formally named McKechnie Field. The Kansas City Athletics played at McKechnie Field from 1963–1968. Ironically, the team left Connie Mack Field for Bradenton, after the Milwaukee Braves arrived in West Palm Beach. The team was not open to sharing their spring training facilities or stadium with the Braves. The City of Bradenton talked A's owner Charlie Finley into staying at McKechnie until 1968. By that time, the A's relocated from Kansas City to Oakland. Finley believed that his west coast team should train on the west coast, in Mesa, Arizona. During the Athletics tenure, Finley routinely tied his Athletics team mascot, a donkey named "Charlie O", to a tree inside the stadium during games." Once the Athletics left Florida for the west coast, Bradenton made plans to attract a new major league club. The city would attempt to lure the Pittsburgh Pirates or the Cleveland Indians to McKechnie Field. The Indians, at the time, had a ten-year contract to play at Randolph Field, located in Tucson, Arizona and were written off by Bradenton officials. However the Pirates were unhappy at Terry Park, their spring training home for 14 years, located in Fort Myers. In February 1968, the city met with Pirates' general manager Joe Brown and owner John W. Galbreath and both sides agreed to a lease of 40 years, with an option for another 40 years. In 1969 the Pittsburgh Pirates began their lease of McKechnie Field. Still the team threatened to move several times in the first 34 years they'd been there. Prior to 1993, the playing field at McKechnie was much less popular with the players, than it is today. Whitey Herzog, the Kansas City Royals manager in the late 1970s, called it "the closest thing to a cow pasture I've seen." Pirate outfielder Dave Parker later stated that "playing in the outfield [at McKechnie] was like playing in a "potato patch"." This lead the city to finally install new grass and built new clubhouses, a grandstand and a press box in the 1980s. But McKechnie was still the oldest spring training facility in Florida, so city officials agreed to give the Pirates a renovated stadium to make sure they'd stay. During the early 1990s, many teams began renovating their spring training sites. At this time, the Pirates were threatening to leave Bradenton for Winter Haven in search of better training facilities. Many of the complaints that were associated with the pre-1993 ballpark include; red sand clotted the infield, old boards serving as bleacher seats and panels hanging loose on the outfield walls. The city then stepped in with a plan to use tourism tax money to rebuild McKechnie Field. The project, which ended up costing $3.4 million. In 1993 it was decided that the aging stadium was in need of a massive renovation. Pittsburgh-based architect, Lou Astorino, of L.D. Astorino Companies, was put in charge of renovating the ballpark. Astorino's renovation was inspired by Forbes Field, the Pirates' old stadium in Pittsburgh, with its outfield walls that were covered in ivy, like Wrigley Field, and the view of trees outside the park. He also chose a Spanish Mission façade based on the old Bradenton railroad station. The Pirates and local officials agreed that any renovation must preserve the neighborhood appeal of McKechnie. After extensive interviews and months of work, an intimate park was recommended with new grounds, wide access ramps, concession stands, kiosks, improved sight lines, while maintaining a ballpark's classic ambiance. McKechnie's old metal chairs that served as box seats, the wooden bleachers were also removed, in favor of more modern stadium seating. The grandstand seen today at McKechnie was built as part of the 1993 renovation and holds 6,602 people. Construction on the new park started in late 1992, and was barely completed by spring training 1993. Workers were still putting numbers on the stadium seats while the Manatee High School band played just minutes before the first pitch on March 5. The stadium's remodeling was applauded highly by Pulitzer Prize-winning author and essayist George Will for keeping the vintage baseball park look. Will was also a part-owner of the Pirates' opponents for their first game in the renovated park, the Baltimore Orioles and was in attendance. The renovation to the Spanish mission-style ballpark preserved the intimate, old-time atmosphere so well that led USA Today dubbed it the "Fenway Park" of spring training stadiums. The red infield dirt was also swapped out in favor of a darker color of dirt during in the renovation, after then-Pirates manager Jim Leyland complained of the glare and heat reflecting from the reddish sand. Lou Astorino would later on to design PNC Park, which became the Pirates' regular season home in 2001. In 2008, to celebrate the Pirates 40 seasons in Bradenton, the team unveiled a commemorative logo celebrating their 40th anniversary of hosting spring training in Bradenton, Florida. The logo was symbolic of the club's long-term relationship with the city. The patch displayed classic Pirates "P" onto the historical façade outline of McKechnie Field. The Pirates displayed the logo throughout spring training on a large billboard just behind the right-center field wall at McKechnie, as well as on the Pirates spring training jerseys. The Pirates tenure in Bradenton (44 years) ranks third in longevity among teams that currently hold spring training in Florida. Only the Detroit Tigers in Lakeland, Florida (65 years), and the Philadelphia Phillies in Clearwater, Florida (64 years) have been in their spring training locations longer. The renovations prior to the 2008 spring training season included a new visitors' clubhouse, a new press lounge and lights. Improvements also included a renovation of Pirate City, the team's southern headquarters, with new offices, player dormitories and a fifth practice field. The deal was partly funded by the state, which wants to prevent any more major league teams from migrating to the Cactus League in Arizona for spring training. Originally, no night games were played at the ballpark for the first 85 years in the stadium's history. However, lights were installed and the stadium hosted its first night game in 2008. Since the first night game was played at Wrigley Field in 1988, McKechnie had been the only ballpark used by a major league team at any time of the year that lacked lights. The Pirates have always played a handful of night exhibition games each year, but never at McKechnie. Previously, the Pirates never saw the need for lights at McKechnie, and never pushed for them. Players and team officials have long been comfortable with the routine of arriving early in the morning, getting in a day's workouts and a ballgame, then enjoying a leisurely dinner at night. However the lack of lights, meant that McKechnie could only be used for only spring training games, and the facility sat empty 11 months a year. The installation of lights was made possible after the city of Bradenton received a $15 million grant from the state of Florida to upgrade the Pirates' spring training facilities. The grant fund was set up to prevent any more major league teams from migrating to the Cactus League in Arizona for spring training. Besides the lights, the grant money paid for a new visitors' clubhouse and an expanded home clubhouse. A lighted McKechnie Field will allow for night baseball and other events, enabling the city to use the ballpark as a catalyst in an area where officials envision an entertainment district. The first night game at McKechnie was originally scheduled for March 7 as the Pirates took on the Cincinnati Reds but the game was rained out. Instead the ballpark's first night game was pushed back to March 19, 2008. The game resulted in a Pirates loss to the New York Yankees, 12-9. The outfield in 2011 with the Pirates' José Tábata in left field and Andrew McCutchen in center. The infield during spring training in 2011. Because of the improvements, the Pirates signed a new 30-year lease that went into effect on February 1, 2008. The team is now guaranteed to play at McKechnie Field through 2037, and after playing two night games in Bradenton in 2008 the Pirates will have many more opportunities to play under the lights over the next few decades. However Pirates' alumni Bill Virdon and Chuck Tanner have both disagreed on the need for lights, stating their opinion that spring training games were meant to be held in the daytime. However the lights would be key to the stadium landing a new minor league team a few years later. McKechnie Field did not host a Florida State League team, since the end of Bradenton Growers era, from 1926 until 2010. From 1989–1990, the Bradenton Explorers of the Senior Professional Baseball Association though played at McKechnie. The Pirates' Rookie Level minor league affiliate, the Gulf Coast Pirates, formerly the Bradenton Pirates, currently play their games at the Pirates training facility in Bradenton's Pirate City complex. However, on November 10, 2009, baseball officials voted to allow the Pirates to purchase and uproot the Cincinnati Reds' Class A affiliate, the Sarasota Reds. The team was renamed the Bradenton Marauders and play all of its home games at McKechnie Field. In return the Red received the Pirates Class A team, the Lynchburg Hillcats. The new Bradenton team began play on April 7, 2010. The inaugural game ended in 18-3 Bradenton victory over the Fort Myers Miracle. In early 2012, Bradenton officials planned to make a $7.5 million loan to pay for "fan-friendly" renovations to McKechnie Field. The proposed upgrades included new seating, enhanced fan plazas, a boardwalk that would circumnavigate the stadium, a tiki bar, more concession stands, restroom improvements, an upgraded sound system and scoreboard. To pay for the ballpark renovations, the city planned to take out a 20-year loan, repaying it primarily from the county's "bed tax", which visitors pay when they stay at a hotel or resort located in Manatee County. Under the deal, the Pittsburgh Pirates, who contributed the equivalent of $150,000 annually to market the city of Bradenton, planned to increase their marketing donation to $400,000 annually. That money was then be used to promote tourism in county. The renovations also allow McKechnie Field to host sports events, such as high school regional tournaments. On February 7, 2012, Manatee County commissioners Tuesday agreed to an interlocal agreement that will provide McKechnie Field with the $7.5 million in renovations. The project was slated to begin after the Pirates’ 2012 spring training season and will continue around the Marauders’ 2012 schedule. Improvements could be completed prior to the 2013 spring training season. The renovations will allows for the metal roof that sits over the grandstand area to be repaired. In 2011, the metal ceilings that occupied McKechnie had to be removed because of corrosion. The removal forced two Marauders home games to be relocated to Port Charlotte. Temporary awnings were put in place for the upcoming 2012 season. Construction of a new, permanent roof is planned and was completed in 2013. On August 16, 2012, the Pirates announced that the team would contribute an additional $2 million to $3 million for the renovations to McKechnie Field, increasing total enhancement costs for their Bradenton spring training home from 7.5 million to approximately $10 million. The renovations' design and construction were performed by Fawley Bryant Architects and NDC Construction, both Manatee County businesses. The renovated was unveiled to the media on February 20, 2013. The changes come on the anniversaries of McKechnie's 90th year in existence, as well as, the Pirates' 45th year at the stadium. With the changes, McKechnie became the fourth largest capacity venue in the Grapefruit League. For both aesthetic and business reasons, McKechnie Field was chosen as the Best Ballpark Renovation, in the Over $1 Million category, of 2013 by Ballpark Digest, the leading guide to baseball and ballparks on the Internet. McKechnie Field hosted the 2014 Florida State League All-Star Game on Saturday, June 14, 2014. The Marauders were represented in the game by outfielder Josh Bell and left-handed pitcher Orlando Castro. The attendance of 5,882 fans for the game was the highest for the league's All-Star Game since 2006 and it was also the 3rd highest attendance in the All-Star Game's 53-year history. In February 2015, the Pirates opened and began using a brand-new 22,500-square-foot facility at the ballpark. According to Trevor Gooby, the director of Florida Operations for the Pirates, "McKechnie was built in 1923, and the clubhouse was probably built right after the stadium was built, so it was the oldest part of McKechnie Field". The walls have the numbers of retired players and dates of victorious championships. There is also a quote from Pirates' legend Roberto Clemente located in the locker room area that reads: "When I put on my uniform, I feel I am the proudest man on earth." Other areas of the building contain a weight room, rehab center and two hydrogen pools. The $6.5 million facility was funded by the Pirates. McKechnie Field was used as the site for each game of the 2016 Florida State League Championship series between the Marauders and the Tampa Yankees due to construction at the Yankees' stadium, Steinbrenner Field. The Marauders defeated the Yankees, in 4 games to win their first Florida State League title. In 1989, for his book,Spring Training author William Zinsser chose McKechnie Field as a classic Florida baseball setting. McKechnie Field was also used as a backdrop for the 1987 HBO movie, Long Gone. 1 2 "Pittsburgh Pirates-Bradenton". Florida Grapefruit League. Retrieved February 3, 2012. ↑ Whitt, Toni (February 8, 2012). "McKechnie Field to Get a Makeover". Bradenton Patch. Retrieved February 14, 2012. 1 2 3 "McKechnie Field in Bradenton". BaseballPilgrimages.com. Retrieved February 3, 2012. 1 2 Mannix, Vin (April 8, 2010). "Bradentown Growers were Marauders' forerunners". Bradenton Herald. Retrieved January 30, 2012. 1 2 3 4 5 6 7 8 Gordon, Jabbo (February 18, 1970). "The History of Baseball in Florida and Manatee County" (PDF). The Manatee County Historical Society. Retrieved February 15, 2012. 1 2 3 Favorite, Merab-Michal (September 4, 2011). "Sunday Favorites: Somehow Old Ball Players Come to Bradenton". The Bradenton Times. Retrieved February 15, 2012. 1 2 Favorite, Merab-Michal (February 2, 2012). "City to Consider Plans for McKechnie Field Renovation at Next Meeting". The Bradenton Times. Retrieved February 3, 2012. 1 2 3 4 5 6 Becnel, Thomas (March 19, 2010). "How McKechnie Field got that swing". The Herald-Tribune. Retrieved February 3, 2012. 1 2 3 4 5 Robinson, Alan (March 30, 2007). "Turn on the lights; party's over as McKechnie Field gets lights". USA Today. Retrieved February 14, 2012. 1 2 3 4 5 6 7 8 9 Carroll, Scott (April 13, 2003). "Baseball, hot dogs and Bradenton". The Herald-Tribune. Retrieved March 16, 2015. ↑ Adams III, Charles J. (March 9, 2014). "Snapshots: Spring training site once drafted as military camp". The Reading Eagle. Retrieved March 16, 2015. ↑ "Pittsburgh Pirates Spring Training Ballpark". Pittsburgh Pirates. January 24, 2008. Retrieved February 3, 2012. ↑ "Pirates Unveil New Spring Logo". The Intelligencer: Wheeling News-Register. January 24, 2008. Retrieved February 3, 2012. ↑ Cormier, Anthony (December 29, 2006). "McKechnie to get lights; Pirates to stay until 2038". The Herald-Times. Retrieved February 3, 2012. ↑ Langosch, Jenifer (March 7, 2008). "Rain puts out McKechnie Field's lights". MLB.com. Retrieved February 3, 2012. ↑ Langosch, Jenifer (March 19, 2008). "Renovation sheds light on Bucs' home". MLB.com. Retrieved February 3, 2012. ↑ "Pirates, Bradenton agree on 30-year lease". Pittsburgh Pirates. December 28, 2006. Retrieved February 3, 2012. ↑ White, Russ (May 26, 1990). "Bradenton Explorers May Move To Daytona". The Orlando Sentinel. Retrieved February 3, 2012. ↑ Biertempfel, Rob (October 30, 2009). "Pirates make another trade". The Pittsburgh Tribune-Review. Retrieved February 3, 2012. ↑ Lembo, Jason (April 9, 2010). "Marauders score resounding win in debut". The Bradenton Herald. Retrieved April 9, 2010. ↑ Kennedy, Sara (February 8, 2012). "County approves improvements at McKechnie Field". The Bradenton Herald. Retrieved February 13, 2012. ↑ Valverde, Miriam (February 8, 2012). "Bradenton OKs $7.5 million loan for McKechnie Field". The Bradenton Times. Retrieved February 13, 2012. ↑ "Shade Returns to McKechnie Field". The Bradenton Marauders' Press Release. February 10, 2012. Retrieved February 14, 2012. ↑ Valberde, Miriam (August 17, 2012). "Pittsburgh Pirates to give as much as $3 million more for McKechnie Field renovations". Bradenton Herald. 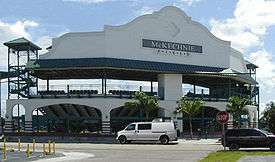 ↑ "McKechnie Field upgrades set for 2013". Ballpark Digest.com. July 23, 2012. Retrieved August 20, 2012. ↑ Biertempfel, Rob (February 20, 2013). "Pirates notebook: Renovation adds to McKechnie Field capacity". Pittsburgh Tribune-Review. ↑ "McKechnie Field Renovations Honored by Ballpark Digest as Best in 2013". Baseball Digest. November 7, 2013. ↑ "Marauders Name New GM". Ballpark Business. October 3, 2013. ↑ "McKechnie Hosts All-Star Game". Bradenton Herald. June 13, 2014. ↑ Loretz, Michael (June 14, 2014). "Bradenton Florida State League All-Star Game Attendance Highest Since 2006". Tampa Bay Baseball Market. Retrieved March 20, 2015. ↑ Nissenbaum, Randi (February 28, 2015). "Pirates get a classy new clubhouse at McKechnie Field". Bay News 9. Retrieved March 16, 2015. ↑ Wilson, David (September 12, 2016). "Marauders finish off Yankees, win first Florida State League title". Bradenton Herald. Retrieved September 13, 2016. ↑ "Crowd sets single-game attendance record at 93-year-old McKechnie". Pirates notebook. Bradenton Herald. March 18, 2015. Retrieved March 20, 2015. 1 2 "Pittsburgh Pirates set new attendance records at McKechnie Field". Bay 9 News. March 29, 2013. Retrieved April 29, 2013. ↑ "Pirates 'obviously' win with Tomlin in town, send down Holdzkom". Pittsburgh Sporting News. Spring training. March 31, 2015. Retrieved April 3, 2015. ↑ Weiss, Zachery (March 28, 2014). "Fans set new attendance record despite rainy spring at McKechnie Field". Bradenton Herald. Retrieved March 20, 2015. ↑ "Marauders Set Records for Overall Attendance and Average Attendance". Bradenton Marauders. September 1, 2013. Retrieved March 20, 2015. ↑ "Attendance Review: 2014 Bradenton Marauders". tampabaybaseballmarket.com. October 21, 2014. Retrieved March 20, 2015.